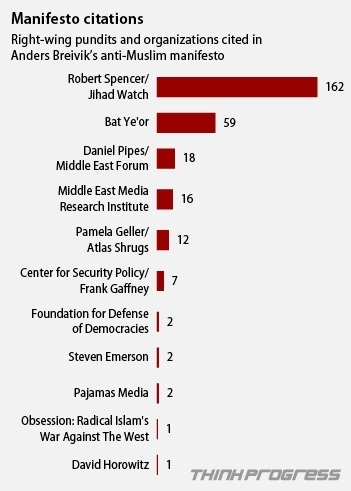 Immediately after Anders Behring Breivik committed his terrorist atrocity in Norway a year ago today, killing 77, the Center for American Progress, a $38 million-a-year liberal think tank, rushed out (under its ThinkProgress imprint) a graphic that helpfully pointed out how often Breivik had cited 11 of what it called "right-wing pundits and organizations" in his manifesto, 2083 — A European Declaration of Independence. CAP's research, which was much cited and had vast influence on the reporting of Breivik's mental formation, would lead one to believe that Breivik's sources of information came exclusively from those "right-wing pundits and organizations." Not so. Although I noted a year ago the essential deceit of this characterization, the full picture became apparent only later, thanks to a complete concordance created by Steven Emerson's Investigative Project on Terrorism of the over 1,600 personal names in 2083. IPT's list of 84 top mentions includes a very wide range of figures. Leftist thinkers: Karl Marx (27 times), Theodor Adorno (26), György Lukács/George Lukacs (26), Herbert Marcuse (24), Antonio Gramsci (23), Thomas Hylland Eriksen (21), Colin Barker (20), and Friedrich Nietzsche (10). Leftist politicians: Tony Blair (20 times), Barack Obama (19), Andrew Neather (15), Javier Solana (12), Romano Prodi (12), and Gordon Brown (11). Muslims: Anwar Shaaban (48 times), Islam's prophet Muhammad (36), Osama bin Laden (29), Yasir Arafat (19), Ottoman Sultan Abdul Hamid (15), Abu Talal al-Qasimy (13), Ahmad Abu Laban (12), Ibn Khaldun (12), Abu Hamid Muhammad al-Ghazali (11), Hasan al-Banna (11), and Sayyid Qutb (11). Christian figures: Jesus Christ (63 times), Pope Urban II (13), Patriarch Nasrallah Sfeir (12), Michael the Syrian (11), and Saint Bernard of Clairvaux (10). Random historical figures: Charles Martel (53 times), Hitler (50), Winston Churchill (23), Duke Odo of Aquitaine (21), John III Sobieski (19), Thomas Jefferson (18), Napoleon Bonaparte (17), Sitting Bull (14), and Benjamin Disraeli (10). Writers: Aristotle (25 times), Ivo Andrić (20), William Shakespeare (20), Plato (16), Salman Rushdie (16), George Orwell (12), Wilhelm Reich (12), and Sigmund Freud (11). (1) I count 13 critics of Islam or Islamism and 11 Muslims among the 84 top names mentioned by Breivik. Pretty much a draw, no? (2) As for Breivik agreeing with those critics: hardly. As I have showed, he intentionally sought to damage and delegitimize anyone who rejects his violent ways. (3) The Center for American Progress distorted Breivik's mind by listing only conservatives – hardly a shock given CAP's history of shoddy work. (4) Concerning all those progressive eminentoes: after Max Blumenthal recently lambasted me in The Nation, a Leftist magazine, for being mentioned by Breivik, I wrote a letter to its editors: "Were the Nation to boycott this posse of Marxists, leftists, and their protégés, its pages would stand quite empty." (5) I am the 9th most commonly mentioned person, bizarrely finding myself right after Islam's prophet Muhammad, tied with Dutch politician Geert Wilders & Osama bin Laden, immediately ahead of Karl Marx. "Antisemite Max Blumenthal Incites Murder of Three in Kansas"
Did Anders Breivik Intend to Harm the Counter-jihad?